Our blog friend Caramel Creme picked up this fantastic sweater at the recent Loft clearance sales for a cool $30. Super cute and feminine! She asked for an idea on wearing it to work in a more professional way. 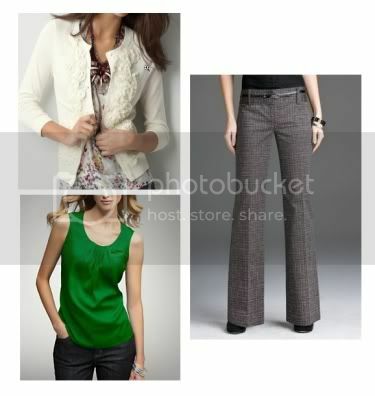 Below are 2 ideas, and if you have any ideas, or even links to yourself with this cardi, please share in the comments! Of course, the exact pieces aren't required, but the shapes will work with the cardigan to make it work- friendly. This is the more conservative of the two, with a collared skirt, and knee length skirt. Oh wow! I love BOTH of these looks, though I think my fave is #1 - I LOVE that bright pop of color!!!! Thanks for the fresh ideas - I'll be trying out both of these looks in the next two weeks. You're awesome! I love a bright pop of color so much hehe. I guess you probably know that.